You can also use the Edit menu > Image Duration, or right-click on the cell and choose Image Duration. You can choose to change the duration of the image you clicked on, all images currently selected on the Storyboard, or all images. To change the duration, either type new numbers into the New Duration area, or use the up and down arrows to change the number. When a title or credit is added to the Timeline, the text is seen over a graphical background. If Include Title background clips is selected, the duration of these graphical backgrounds is set along with all other images. When the correct value is entered, click OK. The image or images will have their duration modified. 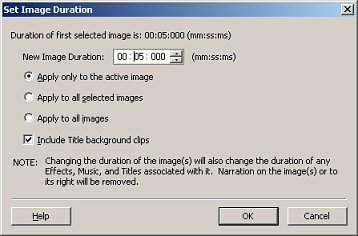 Because changing image duration can result in deleting Narration, it's important to complete this step (if needed) before narration is added.